Support the American Geosciences Institute! The American Geosciences Institute represents and serves the geoscience community by providing collaborative leadership and information to connect Earth, science and people. Our vision is a world that understands and trusts the role of the geosciences in fostering creative solutions for the Earth and humanity. AGI is proud that we have hundreds of loyal and generous donors supporting the power of the geosciences around the country and all over the world. It's because of donors like you that we're able to support many critical projects advancing the geosciences in local communities across the country! Your generous gifts help AGI bring the geosciences to local and international communities, provide the latest educational materials to K-12 teachers nationwide, discover new employment trends for geoscience graduates, and help more graduate students experience AGI internships. You can help in a variety of meaningful ways. 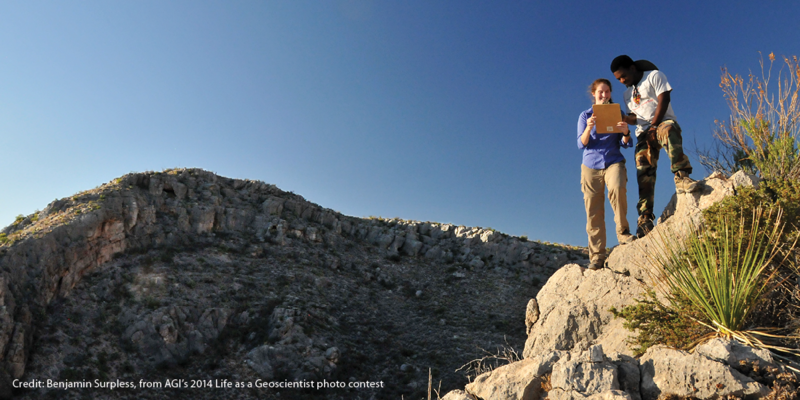 Image credit: Benjamin Surpless, from AGI's 2014 Life as a Geoscientist photo contest. I knew of two of the loves in his professional life - Trinity University and the Balcones Escarpment. Congratulations on 70 years of putting the geosciences at the forefront of society! Keep up your important work! Great mission, great organization, and especially great people! I owe the quality my life and the fascination with the natural world to the geosciences. Geosciences help us to be better stewards of our planet. We desperately need such attention, and Ed Roy embodied a love for this work. Ed Roy was my faculty advisor and a wonderful friend. Worked with Dr. Roy for many years during my tenure at Trinity. He was the epitome of a scholar, mentor and passionate geologist. To honor our friend and long-time colleague, in recognition of his love for the discipline and his dedication to the support of geoscience education. In memory of my friend friend and colleague, Ed Roy.